Dawnstar Sanctuary is a disused Dark Brotherhood sanctuary located on the shore of the Sea of Ghosts near Dawnstar. It was one of the first Dark Brotherhood sanctuaries in Skyrim, but it has been abandoned for nearly a hundred years. It contains only one interior zone, Dawnstar Sanctuary. † They move here at the end of Hail Sithis! ‡ They move here at the beginning of Where You Hang Your Enemy's Head..., once you have exited the sanctuary. *If he survived The Cure for Madness. 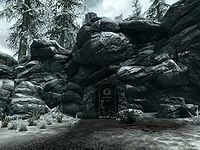 It is built into the rock face on the northern coast of Dawnstar with several nightshade plants growing around the entrance. The entrance is a black door similar to the door to the sanctuary in Falkreath. It cannot be picked and has magical properties requiring the answering of a riddle in order to gain entrance. Thoring, the innkeeper at the Windpeak Inn, when asked if he's heard any rumors will reply: "Everyone in town knows about the Black Door, and to never go near it", which adds the map marker to your map. You can discover the door and location at any point in the game, once discovered you are able to fast travel there, however prior to The Cure for Madness quest none of the three available options in response to the riddle will allow access. During the related quest the password is learnt by reading Cicero's journals. According to his journals when Cicero first brought the Night Mother to Skyrim from Cheydinhal in Cyrodiil he set up home in the Dawnstar sanctuary and stayed there for nearly a month before leaving to travel to the Falkreath sanctuary. During the related quest when you arrive outside the black door you find Arnbjorn sitting on the ground angry and bleeding. He's convinced he injured Cicero and possibly severed an artery, he think you should be able to just follow the blood in order to find him. Activating the Black door causes it to ask the riddle, upon correctly answering it will welcome you. You enter at the top of a flight of stairs, sure enough there is a trail of blood you can follow. At the bottom is a small brightly lit room with a small wooden table on the left with a complete unique Jester's Outfit on top, including hat, clothes, gloves and boots. Behind the table, against the wall is a bookcase with five common books and several ruined ones on the shelves. To the right is an unlocked wooden door with a narrow table to the right with two more common books and a troll skull on top. You can follow the blood trail, however it is fairly linear. Through the door is a raised L-shaped section with a room below seen through metal bars. There is a round wooden table with an iron dagger on top in front of you and a sanctuary guardian off to the left. In an alcove against the west wall, behind some wicker fencing is a snowberry bush among other vegetation. To the right is a passage heading west and to the right of it is small set of shelves holding a copy of The Legend of Red Eagle and a dragon's Tongue flower. Beside this is a square wooden table with a small coin purse, an iron dagger and a single septim on top. A second set of shelves are to the right of the table with a bottle of each alto wine, wine, Nord mead and ale on the shelves. Beside this is the top of a flight of stairs leading down into the room below, blocked by spears. Heading west brings you to a wooden bridge spanning a circular room beneath. On the far side is another guardian. As you approach the bridge a spear trap will start poking several spears across the bridge from the sides, these can be avoided either with good timing or by jumping onto a ledge that circles the room. Once across, the spears stop. On the far side is a flight of wide spiraling stairs leading down. At the bottom there is a crate on the right with a leather strip on top and in front is a table and cupboard. On the left is the room beneath the bridge with oil slicks on the floor and oil lanterns hanging from the ceiling above. There are also two more guardians here. Take care however as there is a tripwire on the threshold to the room that will cause the lanterns to drop. You can use this to your advantage in dealing with the guardians. On the table is a map of Skyrim with a random potion of stamina and a random potion of magicka, a copy of the Archery skill book The Marksmanship Lesson and a copy of the One-Handed skill book Fire and Darkness. The cupboard holds a complete set of worn shrouded armor, only the gloves of which are enchanted doubling the backstab damage. In the circular room there is a cupboard and three archery targets on your left, with a caved-in passage to the right of these. Among the rubble is a patch of Namira's rot fungus. To the right are two practice dummies and to the north a wide passage. On the right of this passage are six weapon racks, another practice dummy and crate and table. On the crate is a pair of iron gauntlets with a random sword on the floor beside it, while the weapon racks hold a selection of random weapons up to Elven in quality. To the north is a set of shelves of the left-hand side holding a salt pile among items of clutter. Beside this is a crate with a goat hide on top. To the right another set of shelves hold only clutter. The passage at the rear leads up to the east and along into the room seen below previously. As you enter the room two more guardians emerge and attack. On your left is a cooking pot on a stand and a crate beside it with iron dagger on top. There is a large broken circular stained-glass window in the northeast wall with an icy passage behind. On either side of this are picture frames with pictures of the black hand in red circles and the word "tenets" written beneath with numbering I—V, they are both very faded so the rest of the writing has been lost to the ages. The room has a raised section against the west wall with a large lit fireplace in the middle. To the left is an end table with a candlestick and salt pile on top, a food barrel behind with a loose piece of firewood on top. In the middle of the room is a long wooden table with two chairs, while against the east wall is a long end table with an iron dagger on top beside an ornamental vase. In the southeastern corner is a wooden door that is barred from the other side and on the floor to the left is an open crate containing a small coin purse under several items of clutter. Against the south wall is the stone stairs leading up to the raised section blocked be raised spears. There is a chain about half way up that operates these. The blood trail enters the icy passage that heads to the southeast and then turns northeast, passing a small spur containing a dead deer and then turning northwest. There is a dead goat ahead with two bear traps nearby. Two passages run parallel to the northeast and both lead to the same cavern, but on different levels. The one on the right lead to a raised platform with a rock bridge linking it to a ledge along the east wall. On this ledge is Udefrykte A large frost troll. There is a dead goat on the far side of the bridge. Further to the right between a couple of stone pillars is an unlocked respawning chest containing gold with three scrolls of Fireball beside it and beyond this is a dead deer and an earthen ramp leading down to the bottom level. The one on the left leads to the bottom level and after passing under a rock bridge you can find the bodies of two skeevers and a horker, as well as many other bones including mammoth bones. The ramp leading down from the ledge is ahead and in the western corner is a passage leading back into the sanctuary. As you re-enter, there is a passage with a caved-in section to the north and a pair of wooden door to the south. There is a blood splatter on the doors and through them there are spears blocking the top of a flight of stairs leading down with the chain on the right. At the bottom of the stairs two more guardians emerge and attack, while along the walls are wide shelves filled with coffins, these are mostly empty, although the odd one may be looted for a few septims. At the end the passage turns west and ahead three more guardians attack. Part way along there is a spur on the left with a master locked respawning chest containing leveled items on the bottom shelf on the right. A short distance further along, the passage turns to the north and climbs a long flight of stairs. The passage at the top is blocked by more spears with another chain on the right. Beyond is a bear trap in front of an open door to a narrow passage, at the far end is a long end table with a thistle branch on top and another black hand image with the tenets written below, this one is as faded as the two previous ones. On the left is the barred wooden door found previously and on the right is another wooden door. You will automatically sheath any weapons and be unable to draw them at this time. Behind the door is a room with a fireplace at the rear and Cicero laying in front. Around the walls are several shackles and small units with sets of torture tools on top and holding the occasional leather strip. As you approach Cicero will engage you in conversation. You must decide his fate. In the northeastern corner is another unlocked respawning chest containing leveled items, while on the right is an open crate containing two iron dagger and another leather strip. At the end of Hail Sithis! Upon the completion of Hail Sithis!, you return here to Nazir who has relocated here with Babette and brought the Night Mother with them. Her stone coffin has been set up on a raised section, on the right by the bars overlooking the main room below. She is surrounded by lit candles on stands. The spear trap on the bridge, the oil lanterns and oil slicks, the bears traps and tripwire have all been removed or deactivated and the trail of blood cleaned up. In the circular room beneath the bridge, where the caved-in passage was, has now been cleared and leads to some sleeping quarters. The patch of Namira's rot is still by the start of the passage, while half way along is a bedroom containing an unowned single stone bed on a raised section opposite the door. In the southeastern corner is a set of shelves holding a steel dagger, a bowl of glow dust, a leather strip, a filled petty soul gem in a stand and a sack of food. On the floor to the right is a basket containing a sample of scaly pholiota, while to the left is an open crate containing two bowls of bone meal and two pieces of creep cluster. Beside this in the northeast corner is an urn. Opposite in the southwestern corner is a dresser containing random clothes, with an iron dagger and three random poisons on top, while in front, next to the raised section is another open crate containing a flute. Finally in the northwestern corner is a crate with a deer hide on top and basket containing three sheaves of wheat and a chair in front. Babette is often found sitting in this room. The passage continues past this room and at the end is a dresser and another bedroom on the right. Along the east wall is a slightly raised section with two unowned single wooden beds, one in each corner. Between the beds is an unlocked respawning chest containing leveled items and an end table with an orange dartwing on top. Behind the bed against the south wall is a set of shelves holding a bowl of ectoplasm, an iron dagger, a bowl of troll fat, a leather strip and a sack of food, with two more leather strips in an open crate beside it. In the northwestern corner is a long wooden table covered in ruined books along with an empty leveled soul gem and a leather strip. Against the west wall is a dresser containing clothes with three iron dagger, a small coin purse and two loose septims on top, with a bucket to the left containing a quiver of iron arrows. In the southwestern corner is a round wooden table and two chairs with a green apple, a bulb of garlic and a piece of bread on top. In the main room the icy passage through the broken stained-glass circular window has been blocked up. The clutter and litter has been cleaned up. In the southeastern corner, where the previously barred wooden door was, is now an open passage leading to a T-junction with the torture chamber ahead. The passage to the south now ends at a dead end after only a few paces. The icy passage, cavern and coffin filled passages are no longer accessible. Speaking to Nazir regarding the assassination of the Emperor will complete the quest, leads him to ask how much the contract was worth and to suggest visiting Delvin Mallory, a member of the Thieves Guild to purchase upgrades for this sanctuary. This initiates the next quest. He will also state that while you are visiting Delvin he will see about recruiting some new initiates to the family. As you approach the Night Mother on your way out, she will speak to you and The Dark Brotherhood Forever quest will initiate, this is an umbrella quest that stays active on the quests page for all future assassinations. You can now purchase upgrades for this sanctuary from Delvin Mallory, a member of the Thieves Guild, just like any other player home. Once you have visited Delvin and purchased at least one upgrade, when you return two initiates will already have arrived, they are followers and available whenever needed. New Banners: Cost 1000 septims. Installs a total of twenty-two new banners throughout the sanctuary. 2 Bottles of Lotus extract. Torture Chamber: 5000 septims. Refurbishes the shackles on the walls so that they work, in the room you originally faced Cicero in. It comes complete with four torture victim shackled to the walls by their wrists, each of which, with a little persuasion reveals the location of some treasure. In addition two brand new racks are installed in the far corners of the chambers and a hot coal-filled cauldron with a heated iron bar resting in the coals on top. Secret Entrance/Exit: 5000 septims. Replaces the circular stained-glass window in the main room behind which is a secret entrance/exit that comes out behind some rocks near the main road into Dawnstar near the inn and where the Khajiit caravans camp. The window has the identical design as the one above the pool in the Falkreath sanctuary, behind which was where the Night Mother's coffin was stood. Master Bedroom: 3000 septims. Removes the dresser that was at the end of the passage with the two bedrooms off of it and adds a new bedroom, with the doorway being where the dresser stood. Opposite the door is a raised section for the bed, which is a double bed coming out from the west wall with a dresser to the left containing clothes, with a medium and a large coin purse, a scroll of fear, a scroll of courage and a scroll of frenzy on top. To the right of the bed is a set of shelves holding a leveled potion of the beserker, a leveled potion of lasting potency, a leveled potion of stamina, a leveled frenzy poison, a leveled aversion to magic, a set of shrouded robes, a worn shrouded cowl, gloves and boots—(see bugs). At the foot of the bed is an unlocked respawning chest containing gold and a pedastal with the unique tumblerbane gloves atop. To the right of the steps leading up to the bed is a basket containing two samples of giant lichen and a sprig of frost mirriam. On the north wall is a row of six weapon racks, while to the south is a long wooden table and chair. In the southeast corner is a mannequin wearing a shrouded cowl, gloves and boots—(see notes) on a round table and in the southwest corner is an empty bookcase. Between these against the south wall are some crate with a bulb of garlic on top one of them. All of the wall also have new banners on them. You are unable to enter the sanctuary without reading Cicero's Journal first. If you activate the black door, you will be given three dialogue options to try, but none of them are correct. 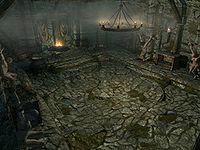 Once you have completed Hail Sithis!, speaking to Thoring at the Windpeak inn and asking about rumors will prompt him to comment: "Did you hear? People have been seen coming in and out of the Black Door. Divines have mercy." The shrouded robes on the shelf and the cowl, gloves and boots are wearable and not to be confused with the worn items that are bugged. All cupboards, end tables, and wardrobes in the location are non-respawning and safe to store items in. At the Black Door, the correct phrase sometimes will not appear in the options even after reading Cicero's journal. Loading a previous save should fix this. In the master bedroom area of the Sanctuary, jumping onto the corner between the platform and central stairs can cause you to fall through the floor and fall into the ice caves blocked off after the Sanctuary is reclaimed. You can escape this area by walking the way you need to go for The Cure for Madness. The large weapons rack in the main hall below the bridge cannot be used to store player weapons. The un-equippable Worn Shrouded Cowl may be missing from the room. ? Dark Brotherhood members do not sleep due to not having proper sleep schedules.